In the 1940s, W. Somerset Maugham offered a word of advice to aspiring writers: "Dont." And if there was reason not to then, surely theres twice the reason not to now: slipping book sales, failing bookstores, dwindling books coverage, the death of the novel, the dearth of poetry, the sound-byte, the music video, reality TV, "whatever." But apparently none of that is reason enough. If the ballooning market for literary instruction is any indication, popular interest in writing is at an all-time high. Todays amateur novelists, screenwriters, essayists and poets support steady sales of more than 3,000 books available on the craft and commerce of creative writing. They subscribe to over 100 periodicals devoted to the subject. The largest of these, Writers Digest, by itself enjoys a circulation of 220,000or roughly seven times that of the prestigious Paris Review, where many of the former publications readers hope one day to see their work published. More than 240 U.S. universities now offer MFA programs in creative writing (up from just six in the mid-1980s), and its harder to get into the best of these programs than into Harvard Medical School. For those who dont make the cut, some 1,200 open-enrollment writers workshops and conferences are held yearly. Even as fewer and fewer Americans incline to read serious literature, evidently more and more of us aspire to write it. There are, in fact, good reasons why record numbers are picking up their pens. 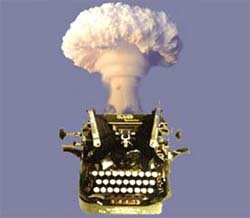 For one thing, technology and affluence have made the writing impulse easier than ever to indulge. Thanks to the word processor, the once laborious task of setting thought to paper (and the doubly laborious task of later revising it) is now essentially painless. And thanks to the Internet, the one-time drudgery of research is now both cheap and largely hassle-free. In the wake of a twenty-year economic expansion, more Americans than ever have the time and money to take up a writing hobby. And more of their children have the luxury of a parental safety net while exploring career options, like creative writing, whose rewards may be more intellectual than financial. For another thing, the difficult literary arts have come to appear less intimidating than ever. Among the reams of unfiltered content online, amateur authors now have little trouble finding a public outlet for their workor concluding that their work deserves a public outlet. And among the books, newsletters, websites, and workshops of the new writing-for-publication genre, anyone with an interest can now find ample encouragement. The titles of popular how-to manuals say it all: How to Write a Movie in 21 Days: The Inner Movie Method, Fast Fiction: Creative Fiction in Five Minutes, You Can Write a Novel. Advises one popular guide, "All you need is the willingness to be labeled writer, and with that one word, you are a writer." You are? I guess I am. Still, its hard to believe so many would brave the blank page if it werent for the potential payoff. Not all writers hope to turn a profit from their labors. But in an industry not unknown to pay seven-figure sums for first efforts, the lure of fame and fortune has no doubt attracted many. And success can seem so easy. Last year saw the publication of a record-setting 135,000 new book titles, with more of them written by first-time authors than during any other year in history. "Debut Fiction" has become its own highly successful genre, given publicity through Barnes & Nobles "Discover Great New Writers" series and special issues of periodicals ranging from The New Yorker to The Village Voice. Elizabeth Wurtzel, Irvine Welsh, Helen Fielding, Will Self, Zadie Smithliterary celebrities have become a dime a dozen over the last ten years. One of this springs most widely praised novelsJonathan Safran Foers Everything Is Illuminatedwas the first work of a 24-year-old. One of this summers most highly anticipated debutsNick McDonells Twelvewas authored by a high school student not yet 18. Some of the best-selling books of the past decade (Angelas Ashes, The Liars Club, A Heartbreaking Work of Staggering Genius) have been memoirs crafted from the fabric of largely unremarkable lives (an impoverished childhood in Ireland, a dysfunctional family in Texas, a little brother and a lot of irony in San Francisco). Never, it might appear, have the prospects for an aspiring author looked so bright. In truth, theyve probably never looked dimmer. Total adult book sales fell 6.4 percent last year, with further declines predicted. Behind publishings occasional high-profile success story lurk thousands of good books that navigate the long and fraught road to publication every year only to vanish in obscurity. And even laying aside the oft-cited woes of the book business, America today is hardly a country conducive to the literary enterprise. Inactivity (what most writing looks like from a distance) doesnt sit well with the Protestant work ethic. Solitary reflection (one of the few things in our society thats still entirely free) doesnt mesh with the spirit of capitalism. In a culture defined by its athletes and film stars and entrepreneurs, a culture where the SUV and the cappuccino can masquerade as self-improvement, where income is the ultimate yardstick of achievement and the bottom line is usually just thatin such a culture, writing can be a hard path to walk. Anyone to purchase a ticket in the literary lotto, I suspect, secretly owns up to these hard truths. But in todays America, celebrity and wealth can feel like the only dreams worth having. And its always nice to dream. Not that financial disappointment will discourage many of todays literary hopefuls, though, for the same reason Maughams advice didnt discourage many 60 years ago: The writing bug, when it bites, passes on an infectious logic of its own. For those bitten, making sense of the world (what all writing, regardless of form, in some manner attempts) comes to be its own compensation. And turning ones gaze away from immediate economic necessity, real or imagined, (what all writing, regardless of motivation, to some degree demands) comes to contain its own reward. Myself, Ill confess Im not above the occasional fantasy about my soon-to-be-written blockbuster. But more often, I value my writing precisely as an escape from such exhausting fantasies. They tend to be as much about the bitterness of failure, Ive found, as about the anticipated pleasures of success. Will Americas swelling ranks of amateur authors produce work of any value? Does it really matter? Among our attempts, Id like to think, lies evidence of a certain maturation of the American psyche: a turn to intellectual life by a country that recently seemed more intent on making millions than finding meaning. And surely we could do worse than to encourage it.